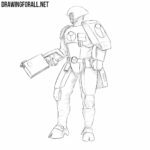 Today we are completing our series of drawing lessons for the major races from the Warhammer 40 000 Universe. And in this drawing tutorial we will show you how to draw a Tyranid. 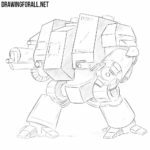 The very base of any drawing is the stickman and this tutorial about Tyranid from Warhammer 40 000 is no exception. First of all, we sketch out massive elongated head, thorax and pelvis. With very simple lines, we outline the limbs and tail. Now we draw the contours of the body of this monster. We’ll start work with the volume in the dicrection from the head and move to the tail. 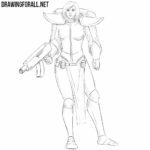 Sketch out the “arms” contours and silhouette of torso, which narrows to the pelvis. With the help of light lines sketch out the paws with hooves instead of feet and snake-tail . Now is the time to draw the contours of the little evil eyes. Also in this step, we draw the upper paws of our monster. Unlike the average pair of limbs, the upper paws are not at all like human hands. So we continue this drawing tutorial about how to draw a Tyranid from Warhammer 40 000. In this step we draw out the contours of this horrible head. On the forehead we draw several plates that similar to сurly bracket sign. 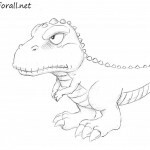 Small, angry eyes and a wide mouth with sharp teeth are localized under the massive frontal bone’s area. Now we will work with the upper paws. These paws consist of three parts. They are very similar to the paws of insects. Also in this step, we draw plates on the shoulders of the second pair of paws that look like human hands. At the end of this step, we put several lines on our monster’s torso. 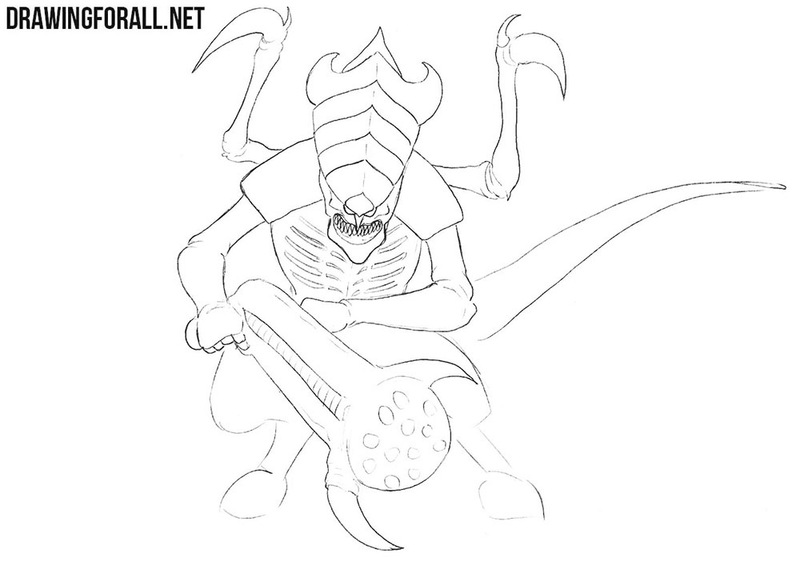 Continuing the lines of the shoulders, we carefully draw the contours of Tyranid’s arms. After that we gently draw the palms that hold the gun. Note that this palms very similar to human hands. Remove all unnecessary guidelines and move to the legs. This will be a very short step. Here we draw the final contours of the legs with hoofs. After that we take an eraser and remove all unnecessary guidelines from legs. In order to draw shadows, you first need to think of where the light comes from. In this case the light falls from the upper right corner. So using hatching of different density we add shadows in the least lit areas of the head and corpus. Also, you can make the shadows more contrast by adding another layer of hatching. 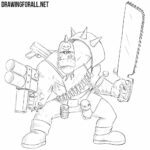 We have prepared for you a huge number of various drawing lessons that will appear on our website in the very near future. So do not forget to visit our site as often as possible, so as not to miss the new lessons from our artists.